Amanda's Parties To Go: Halloween done.... Fall treat YUM! I hope you all had a wonderful time trick or treating this weekend. The weather was perfect here -- not too hot, not too cold. We gathered for our traditional neighborhood block party (I'll share some pictures later today) before we all went door to door with our little goblins to search for the best candy in the land. And the funny thing is, when we got back home, my oldest said, "Mom, I had no idea what kind of candy you bought. I should have just stayed here! We had the best candy anywhere!" How much easier would THAT have been?? Ha! I'm just kidding! I LOVE getting my children all dolled up in their Halloween best. A silly, fun candy-filled holiday -- what could be better? And now, with the chill in the air, a little football on TV and the leaves beginning to fall, well, it's time to put our pilgrim hats on and talk some turkey. I'm super excited about my week ahead. I've got Thanksgiving on the brain and soon will have gorgeous personalized Thanksgiving printables in my Etsy shop. They are designed and ready to go and I will work on a photo shoot using the printables on Thanksgiving dessert and dinner tables in the next few days, so stay tuned! It's going to be beautiful, and I hope will inspire your own Thanksgiving decor. 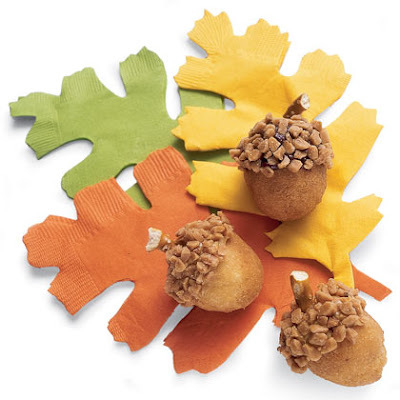 Today, I wanted to share a recipe that will hopefully be a fun one for the whole family.... Acorn doughnuts. These are just adorable and so simple to make. Family Fun has the recipe, so hop on over and make some sweet after school treats. Aren't these the cutest? And I love how they took a solid napkin that you can find anywhere, and cut a leaf shape from it. I'm heading out to the store this morning to find some doughnut holes to surprise them -- I was going to have them all ready when they got home today, but I think I'll just let them make these themselves -- they'll love it. Art project and snack all rolled into one! And by the way, Save the Date For Cupcakes has a FABULOUS giveaway going on right now for $300 in fun FREEBIES! Click the link and sign up soon -- the contest is over tomorrow!